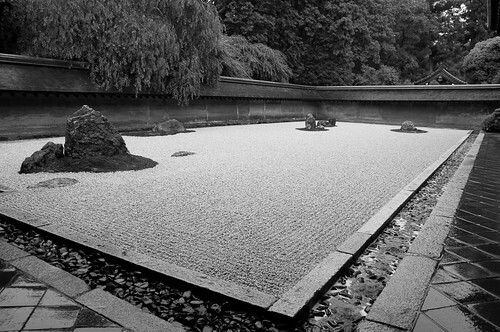 The karesansui (dry landscape) rock garden in the Ryoanji temple in Kyoto, Japan, contains 15 seemingly randomly placed rocks in a sea of raked gravel. A study published in Nature of the visual of this oddly satisfying composition revealed a clear structure to the ‘empty' space of the garden. Thus, the artist was arranging space, not objects. In doing so, they removed a lens from the viewer. Unwittingly unburdened of the ‘focus on the form' prism, the viewer is relieved, calmed. If we put this in terms of your own martial art, the mind is not detained by the hand that brandishes the sword. Completely oblivious to the hand that wields the sword, one strikes and cuts his opponent down. He does not put his mind in his adversary. The opponent is Emptiness. I am Emptiness. The hand that holds the sword, the sword itself, is emptiness. Understand this, but do not let your mind be taken by Emptiness. In Chuang-tzu's book of Chi-hoku-yu (荘子 知北遊篇), it is written, "There is nowhere that Tao is not. It is everywhere." The entire universe is Tao, and it is ki that gives birth and life to all the phenomena in the universe. It is also said that in order to know that ki and the flow of ki, one must know Tao. It appears that this is the origin of the words, Seeking Tao, and Mastering Tao. Lao-tzu referred to one who has mastered Tao as mu-i-shi-zen (無為自然, natural and unaffected). Chuang-tzu interpreted this as unlimited emptiness or absolute nothingness. When one grasps and masters the flow of ki of all the phenomena in the universe as it is, one is in the state of mu-i-shi-zen and absolute nothingness. To strive to attain such a state is a true way of life for humans. This is what Taoism teaches. To fill the abyss's void with emptiness. The moment we try to fix our attention upon consciousness and to see what, distinctly, it is, it seems to vanish: it seems as if we had before us a mere emptiness. When we try to introspect the sensation of blue, all we can see is the blue; the other element is as if it were diaphanous. Yet it can be distinguished if we look attentively enough, and know that there is something to look for. Our bodies are given life from the midst of nothingness. Existing where there is nothing is the meaning of the phrase, Form is emptiness. That all things are provided for by nothingness is the meaning of the phrase, Emptiness is form. One should not think that these are two separate things. Form is not different from emptiness, and emptiness is not different from form. Form itself is emptiness, and emptiness itself is form. Emptiness. Nothingness. The void. Maybe these ideas are useful in the martial arts. Maybe not. That depends on you. But as well as the metaphysical concepts there are practical ways we can use emptiness. First there is ma ai. That is the distancing. Again the concept of space. The critical distance between us and an opponent. The ma ai changes depending on the circumstances. The opponent's height and reach, for example. If the opponent has a weapon or not. What the weapon is. We always have to control the ma ai. To set a correct ma ai. We shouldn't let the attacker choose a ma ai for us. In practice it is sometimes good to use ma ai which feel uncomfortable. The perfect ma ai is at the edge of being dangerously close. There is another point about this critical distance. It is self-evident for people who train in weapons or in striking martial arts. It is a concept which has important tactical points about seizing and keeping the initiative. If we are close enough to strike the opponent we are close enough to be hit. That applies in boxing where a mistake could be painful. And it applies in the sword where a mistake could be fatal. So we have the space. The gap. If there is a chance that we will be attacked we have to close that gap. In aikido we use irimi. Entering. In The Book of Five Rings Miyamoto Musashi talks about the body strike and entering into the opponent's space. By mi no atari - body strike - is meant to push one's way into the space of the opponent and to hit into the body of the opponent. If the attack is fast the irimi can become almost a negative irimi. We don't have to enter physically because the attacker does the work for us. We absorb the attack. Sucking it in and neutralizing it. When we enter, we should just enter. As well as emptiness in space - in three dimensions - there can be emptiness in time too. Time stops. We fill the emptiness. It is the same irimi. Just enter. I'll finish with another quote from Miyamoto Musashi from The Book of the Void. Thanks. This is more like it for me. These are the types of views I adhere to in order to gain the true essence of Aikido. Just reading such things makes me feel good. O Sensei reportedly said something along the lines of "Unless you embrace the Void, you cannot do aikido." Once I came to an understanding of what this means, it has made all the difference. And thank you too, Ross. Great quote and cool concept. You don't live in the walls, floors or ceilings of your house or apartment, you live in the voids between them. "The notes I handle no better than many pianists. But the pauses between the notes ah, that is where the art resides." "A pause is not a break in the dance, it is THE dance itself." Thanks David. Those are great quotes.